It’s time to find out the 5 best chest exercises and how to create the ultimate chest workout that’ll give you pecs better than Batman’s armour. A bigger chest and bigger arms are the first things on the muscle building shopping list for most guys. In fact, 99% of guys I speak to want seam splitting arms and chest muscles Batman would be proud of. But what are the best chest exercises that will actually make that a reality? And how do you put all the know-how together for the ultimate chest workout? Because let’s face it, it’s not that easy to figure out what you should be doing in the gym. Without doubt, you know that you should be doing some form of bench pressing. But what about cable crossovers, flyes, push ups, supersets, drop sets, and giant sets? Do all these need to be in your workout for it to be effective? And then there’s rest periods and rep ranges. How do you know what’s right and what’s wrong? In this article you’re going to find out the best chest exercises that will help you build mass. And how to construct the ultimate chest workout at the same time. Follow the guidelines in this article and you’ll see great progress in your chest development within weeks. 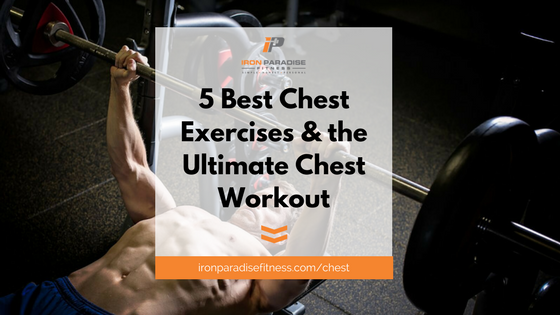 So let’s cut through the confusion and find out what the best chest exercises are and how to create the ultimate chest workout. Following this plan will result in your chest muscles growing significantly. Consequently you’ll need some cash set aside for a new set of clothes. Because busting through the seams of your favourite work shirt just became a problem. So if you’re all set, let’s get down to it and start flexing those pecs. Who is this workout aimed at? Creating an awesome workout of any description really needs to take into account the individual that’s going to be doing it. Because everyone has a different experience level and different strengths and weaknesses. For example, if you’re an experienced weight lifter, you’ll probably want a very specific training programme. After all, you’ll be in the realms of squeezing out every last bit of muscle possible. And you might need to focus on weak points to round out your physique. So, the best way to guarantee maximum results is through a personalised programme. Because it’s the personal touch and tailored process that’s the real secret to achieving maximum results. And while that personal approach is still 100% valid for beginners and intermediates, the principles I’m going to describe in this article are a great starting point. So if you’re someone that’s never set foot in a gym before, or you’re lost as to what the best chest exercises are. Then this article is for you. And if you’re that more experienced weight lifter then this article is still for you too. Because if you mainly focus on high reps and volume, then a strength-based training approach could open up a whole new world of gains. Without doubt, this article will show you that high rep, high volume workouts aren’t optimal. Building the Ultimate Chest Workout has 5 steps. There are a few steps I need to guide you through to create that ultimate chest workout. Because exercise choice is important, but we also need to consider rep ranges, rest periods, and how to build that great chest workout into your overall routine. Follow these 5 steps consistently over time and you won’t be disappointed with the results. All you gym regulars out there know that know that Monday is International Chest Day. It’s become standard practice in gyms all over the world. Whatever your training split is for the rest of the week, chest day happens on Monday. Monday morning comes and texts start flying between gym partners. The excitement builds about getting under that barbell and lifting some mass. It’s probably a reflection of what I said earlier about the overwhelming majority of guys wanting that bigger chest as their main priority. And my first tip is to embrace this concept. Dedicating a specific day to chest is a great strategy to getting the maximum amount of benefit for that specific muscle group. Because you’re not thinking about having to tag on shoulders and triceps exercises that will ultimately reduce your focus on chest. With an entire workout focused on that one muscle group will mean you can blast the chest from all angles and punish it into submission, forcing it to GROW! My advice would be to create your own international chest day that doesn’t fall on a Monday. I hate that feeling of getting all psyched up and motivated to train, only to find that all the equipment you want to use has been taken up. You feel deflated. You compromise on exercise choice so you’re not just stood around waiting, which leads to a lacklustre, sub-par workout. Don’t lose sight of where you chest workout sits in relation to everything else. When you’re planning your training split you need to to think about where your chest workout falls in relation to the other muscles groups you’ll be training during the week. For example, it would be a bad idea to plan chest the day after you’ve crushed a tough tricep workout. Your arms will be fatigued and weaker, which is going to impact and ruin your chest session. Personally, I leave at least 2 days between chest and any other workout that primarily focuses on push movements (eg shoulders and triceps). I want to make sure that when I’m lying under that barbell I have total confidence I’ve recovered fully from my previous workouts and I can give this my all. If you’ve got an element of doubt or some lingering DOMS then I guarantee you won’t be getting all the gains possible out of your chest workout. Dedicate a specific day to chest and leave enough time to recover from any prior push-dominant workouts like shoulders and triceps. There’s hundreds of exercises that work the chest. Flick through a fitness magazine and you’ll see all sorts of weird and wonderful exercise that will claim to get you those chest gains in a matter of weeks. Be it barbells, dumbbells, kettlebells, or body weight exercises the choice is almost endless. And this is the point that can make or break your results and it’s a noticeable stumbling block for a lot of people. I look across the gym floor and despair at some of the crazy stuff people do in the gym. They clearly have the motivation and desire to build muscle and / or lose some body fat, but they’ve unfortunately picked up some bad advice along the way. Maybe that subscription to [insert any fitness magazine name] wasn’t quite worth the money! So which exercises should be planning into your ultimate chest workout? Which are the best chest exercises to build mass? Compound exercises should be the staple of your chest workout. They recruit more muscles, activate more muscle fibres and allow you to move more weight. And the more weight you lift, the stronger you’ll become. And the stronger you become, the bigger your muscles will be (in very simplified terms). It sounds like a really simple process. And it is! Too often, the world of fitness is made too complicated by people out there that want to keep taking your money, rather than tell you what’s best to get results. Complex training programmes and switching exercises every week might make your Personal Trainer seem knowledgeable and make you feel like you can’t do without them. But the reality is a simpler routine would get you better results. My approach with Iron Paradise Fitness is to add value to you. My aim is to not just transform your physique, but to also increase your knowledge of training and nutrition, so you can be more and more self-sufficient. That might be counter-intuitive, but it comes back to the fundamental principle I believe in of doing what’s best for the client at all times. Anyway, back to the best chest exercises of all time. 2 exercises that need to be in every chest workout are Flat Barbell Bench Press and Incline Barbell Bench Press. These are your ‘go-to’ exercises. Keep them in your routine at all times. The barbell exercises allow you to move heavier weights, which is going to stimulate muscle growth and strength. But it’s important to balance this out with movements that promote a full range of motion in the chest muscles. Smith Machines are off limits in this workout. They offer too much assistance and support for the exercise. It’s the equivalent of riding a bike with stabilisers on when your 20 years old. It’s just not right. It’s free weights all the way baby! Smith machines do have their place, just not right now, and not in this workout. Barbells are great, but they have a limitations when it comes to working the chest. And that’s why I like to supplement with dumbbell lifts during my chest sessions. Pick either flat dumbbell press or incline dumbbell press depending on what your physique needs the most (we’ll cover more on that in point 4). Now you’ve done 3 of the best chest exercises, which have hit the chest from different angles, used different ranges of motion, and focused on maximising strength. This workout is looking pretty awesome already. There’s just one more exercise to go. What? Only 4 exercises? Yep. That’s right. Just 4 exercises. That’s all you need to create the ultimate chest workout. If you’re doing these lifts properly and putting every ounce of effort into every rep, then you won’t want to do much more than 4 exercises. For the 4th exercise you can’t beat weighted dips. This will give you another angle to hit your chest from and it’s a great finisher to the workout. And if you can’t do weighted dips, no problem. Do a body weight dip to failure. Focus on form, being mindful not to dip too low and damage the shoulder. This should BURN! And that’s it for exercise choices. 5 exercises to make that chest grow. Just programme in 4 of them and you’ll have the ultimate chest workout for building mass. Remember. Lifts that build mass need to make up the majority of your workout. Isolation exercises might give you a nice chest pump, but they’re not doing much to build size. And if you’re at a more advanced stage of you training and want to add extra volume, then add in those flyes and cable crossovers at the end of your workout. Keep the compound lifts upfront where you have the most energy and focus. Strength is the foundation of the programmes I put together for clients. Having a solid foundation and a strong overall body is the fastest way to that aesthetic look and the transformation you’re looking for. So far we’ve established the best chest exercises you need to be doing. Now we need to look rep ranges so you can get the most out of them. Training in the 4-6 rep range is proven to be the most effective way of stimulating muscle growth and build strength at the same time. I wrote an article which you can read here that explains all the science behind it. For me, there’s no doubt that it’s the most effective way for you to train. Find a weight you can lift for 4 reps. That’s your starting weight. Each time you hit the gym for chest day, your objective is to do one more rep (if you can do more that’s great). That one rep signals progress. It might take more than a week, but you know you’re moving forward and getting stronger. When you reach 6 reps that’s the time to up the weight. You don’t have to whack 20kg on the bar, just enough weight to put you at 4 reps again. Then just keep repeating the process. That’s ‘progressive overload’ my friends. You’ll be working hard during these sets, so you need to make sure you’re recovering enough between sets. You want to give yourself time for your heart rate to come down and to compose yourself before getting under that bar again. I recommend 2-3 minutes as being the ideal amount of rest time. It gives you the recovery you need, while at the same time not being so long that your workout drags on for hours and hours. I worked exclusively in this rep range and was taking 3 minute rest periods while I was training to make my own transformation a reality. The only time a varied the rep range was for body weight exercises and the odd isolation exercises at the end of a workout (we’ll come on to that in a minute). Take a look at these two pictures, which were taken 9 months apart. This is what the best chest exercises and the right overall approach can do for you. I think you’ll agree there’s a significant difference between the two . And it’s clear that the advice I’m putting into this article has the has the desired effect of building mass in the chest. If you want to achieve this look then Tony Robbins has some good advice for you. By that token, if you like my style of physique then following my advice will put you on the right track. The key point to takeaway here is that strength is the foundation that leads to maximum growth. You’ll not only look great, but you’ll be stronger than ever before as an added bonus. And let’s face it, no-one ever complained about being too strong. EVER! Everybody has parts of their physique they’re not happy with, but it’s not always clear how to rectify the problem. When I first start working with a client, I always ask for 3 photos. This isn’t just for the purpose of creating great before and after pictures. It helps me to pinpoint those weak points and design a programme accordingly. In terms of the chest, by far and away the most common issue I see is an under-developed upper chest. Typically guys have a heavy lean towards set after set of flat bench press, flyes, and cable crossovers. They may be getting a great pump, but the upper chest is not getting worked nearly enough and a distinct muscle imbalance is being created. To combat that, you need to identify and work on your weaknesses. And whatever your weakness is you need to make sure that’s the first thing you do when you start your chest workout. If the area you need to work on is the upper chest, then structure your workout to hit the upper chest first. Then follow that up with a second incline exercise for your 3rd exercise. You’ll be hitting your weak-point with your energy levels brimming over, putting you in the position to really give it everything in those first sets. Switch to your flat bench barbell press for your second exercise to give the upper chest an extra opportunity to recover. But when it comes to exercise number 3 it’s time to go again. This time use the dumbbell variation and a slightly different angle on the bench (I normally opt for a slightly shallower angle). This is hitting the chest from yet another angle while also working through an extended range of motion. Just make sure you’re doing the movement with good form. I also like to push the rep range up to 8-10 for the third exercise. So by hitting the part of your chest that is lagging behind the most first as well as multiple times in the workout you’re progressing towards a much fuller looking chest and ultimately that Batman armour look you’ve been longing for. The good old gym pump. Hands down the best description of the gym pump feeling was from the Austrian Oak himself, Arnold Schwarzenegger in the 1977 documentary film, ‘Pumping Iron’. It’s no wonder gym rats the world over crave that feeling in each and every workout. At this point there’s no need for me to repeat myself and tell you that the gym pump is not the way to build mass, but I will say this. I’ve come to realise that incorporating an exercise or two at the end of a workout that’s solely designed to achieve that pump can be hugely beneficial, psychologically. It’s not necessary from a muscle building point of view. All the other exercises have got that covered. They really are the best chest exercises. But there is something to be said for throwing an exercise in at the end just purely for the fun of it. Walking off the gym floor into the changing rooms, chest pumped up to the max and veins popping is a great motivator (plus it makes your gym selfies look that much better). So to satisfy that strain of vanity in you, plan an isolation exercise like flyes or cable crossovers at the end of your workout (if you have time) and push the rep range up to 10-12. That should have the desired effect. But this should not come at the expense of another exercise in the workout. The other exercises make you grow. These do not. Here’s a sample workout that takes into consideration all the points you’ve just read through. Copy this and your chest will be looking all sorts of awesome in about 3 months time. The best chest exercises and creating the ultimate chest workout is just one component part of your overall fitness programme. You need to make sure all your other sessions are as effective and your nutrition is equally focused and targeted to achieve your goals. And to do that, I want to help you create the perfect nutrition plan that gets you to your goals. But most of all I want to show you that it doesn’t need to be bland foods and a life of boredom. Because a well designed meal plan can be full of foods you love. There’s no need for tons of restriction and misery. However, setting up that nutrition plan can be a bit of a minefield. It’s all talk of energy balance, macros, micros, intermittent fasting, protein shakes, and supplements. And that can leave you more confused than when you started. To give you a way through the minefield I’ve created a completely free online nutrition workshop. My 7 Steps to get Lean course is designed to give you all the information you’ll ever need to set up the perfect nutrition plan. In the workshop I’ll walk you through the exact approach I use with all my clients to achieve great results. And it’s also the approach I use to build my own physique. So if that sounds good then you can register your place for free by clicking the image below. So if that sounds good, just click on the image above and register for free. I hope you enjoyed finding out about the best chest exercises and the ultimate chest workout. If you did, leave some comments below.